Illustration: Jeanne Raffer Beck. Pages 1. Illustration: Jeanne Raffer Beck. Pages 1 (detail). Ever since the creation of human writing there has been a fascination with the written word. At times it seems almost magical that abstract shapes can give us an understanding and knowledge not only of the world around us, but also of the individuals that inhabit it. When you take this analogy across time it becomes both astounding and poignant, with generations passing down glimpses of their personality, dreams and fears to those who follow after them. 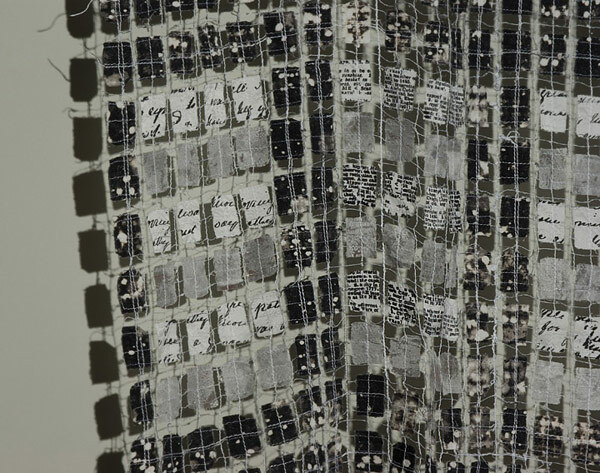 American textile and mixed media artist Jeanne Raffer Beck has made the written word one of the central cores of her creative work. As a long term professional writer she has an innate understanding of subtle inflection and intonation, the boundaries of words and the complexity of language. Although the written word cannot give us nearly as much information as the spoken word, with its particular and individual inflections and tone, there is a difference that can be measured within the parameters of the written word itself. Illustration: Jeanne Raffer Beck. Pages 2. Illustration: Jeanne Raffer Beck. Pages 2 (detail). 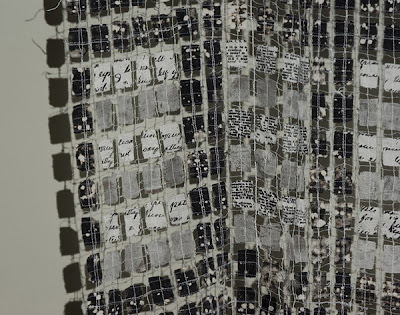 Beck has come to the fascinating conclusion that the hand-written word, as opposed to that of the printed, can in fact give us, through personal calligraphy, an intimation of feeling, emotion and character of the individual. 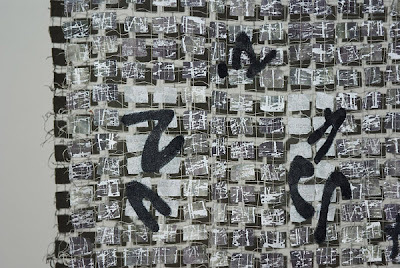 It is the hand-written nature of old diaries, letters and journals that the artist uses in her work that give us the beginning of an understanding of the personal nature of calligraphy itself. This becomes somewhat poignant in our own time as the skill of personal hand-writing retreats to ever more infrequent usage, producing the result of an increasing separation, or at least distancing from the intimacy and connectedness to those in our own era, and perhaps even more importantly, to those who follow us. Beck has used the idea of hand-writing and personal calligraphy as a inspirational starting point and stepped further along the creative road by studying the results as a form of personal mark making. By breaking down and deconstructing the original lettering, and intuitively over imposing more marks and symbols of her own, she is able to take personal hand writing to a different level, in some ways reinventing the original to reflect a new and personal experience of her own. Illustration: Jeanne Raffer Beck. Pages 3. Illustration: Jeanne Raffer Beck. Pages 3 (detail). This is a fascinating and fundamental examination of the use of written language that is utterly compelling. It begs questions as to what the reading and writing of language means to us on a personal, creative and community level. It also raises questions as to our own era and the death of hand-writing as an expression of our own identity and personal parameters. That a writer has been able to open up another avenue of personal exploration and creativity within the field of art is inspirational. The cross-creative process whereby the experience accumulated in one discipline is used to expand the parameters of another is one that should be equally encouraged and applauded. Illustration: Jeanne Raffer Beck. Pages 4. Illustration: Jeanne Raffer Beck. Pages 4 (detail). 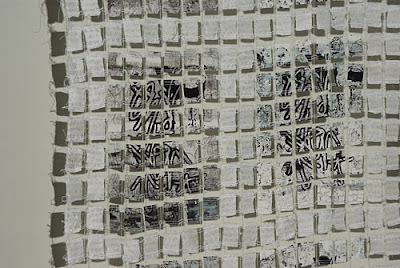 Jeanne Raffer Beck has exhibited her work across the USA as well as the UK. Her work has also been published widely and she has even been featured in TV. She has her own comprehensive website as well as a regular and fascinating blog. Both of these can be found below in the Reference links section. Images were made available with the kind permission of the artist. Jeanne is a friend and I am a big fan of her work. So happy that you have highlighted her work. I have long been fascinating by the letter words, in books, through typography & type design, in lettering, in hand writing. 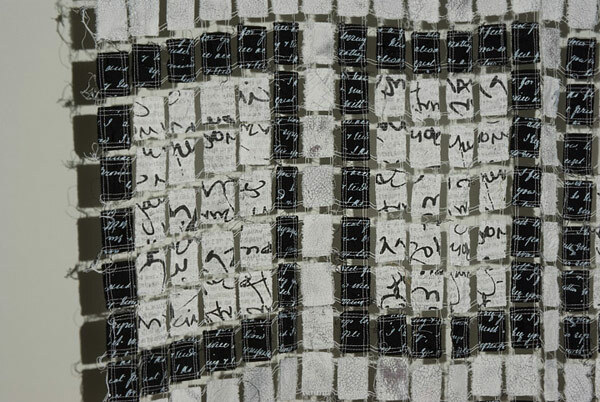 Letters & words are one of the most interesting concepts ever invented by the human mind. It's very good to see it used in that way. Thanks for your comments regarding this article. 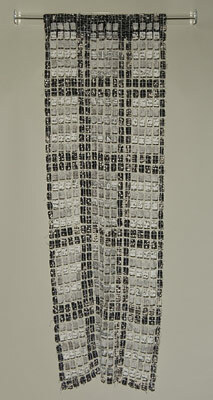 The next contemporary textile artist to be featured will be Clare Plug. I, too, admire Jeanne's work. We are "virtual" friends, and it's been my pleasure to follow her blog, and her development as an artist, finding her voice, for several years. Her work is unique, and I think has risen to the level of fine art. I enjoyed your article, John. Thanks you for your comment Rosemary. It was a joy to do and I am pleased that so many people seem to enjoy Jeanne's work.